Mumbai: The Shiv Sena cleared up that it did not wish to cease its grouping with the Bharatiya Janata Party (BJP) over the president selection matter. On Monday night, the political party made a decision to back up the UPA applicant Pratibha Patil as she was a woman and a Maharashtrian. Uddhav Thackeray, Shiv Sena’s executive president fended for his party’s selection and stated that it gave more significance to what the common man in Maharashtra thought. At the same time, BJP leaders responded powerfully in New Delhi and accused the Shiv Sena of disloyalty. 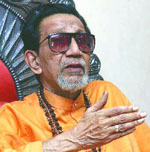 Mr. Thackeray alleged it was a situation of pride that for the first time, a woman had been chosen that too from Maharashtra, for the highest office in the country. It was an admiration for the entire State and all citizens should feel happy, he added.